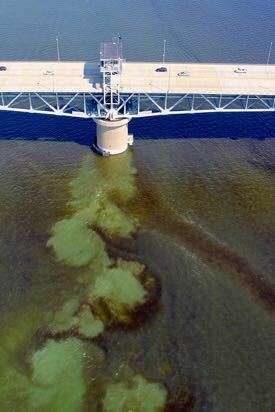 Guiding Flight The VIMS Dataflow research vessel moves toward a York River bloom with guidance from drone imagery. © D. Gong/VIMS. Aerial Drone The VIMS drone can fly at 45 mph and for 30 minutes before its lithium-ion batteries need recharging. Its camera is equipped with a 20-megapixel sensor that can shoot both high-resolution still images and video. © D. Malmquist/VIMS. Drone Operation VIMS Ph.D. student Lydia Bienlien (L) and professor Kim Reece (R) look on as professor Donglai Gong operates the aerial drone. © D. Malmquist/VIMS. 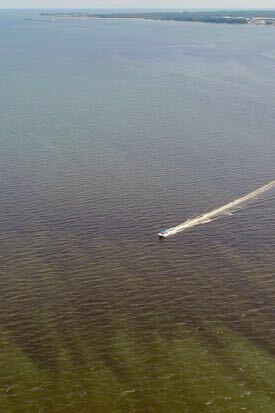 Now, researchers at the Virginia Institute of Marine Science are using aerial drones as ‘eyes in the sky’ to guide their seafaring colleagues to the densest bloom patches, allowing those onboard VIMS vessels to collect water samples with much greater efficiency and lower cost. 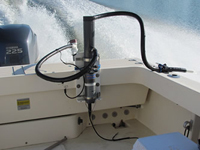 VIMS scientists analyze those samples to identify whether they contain toxic algal species that might threaten marine life or human health. 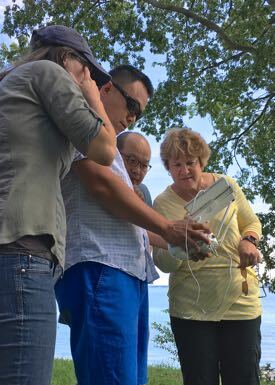 Gong, a physical oceanographer, didn't set out to visualize algal blooms when he launched the drones earlier this summer. He obtained them in 2014 for studying shorelines and marshes. Measurements from Dataflow also help delineate bloom boundaries. 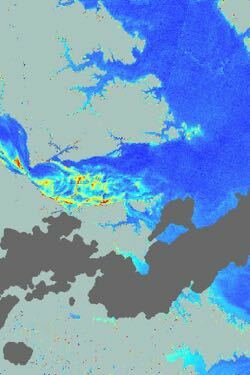 VIMS professor Mark Brush, who brings expertise in estuarine productivity and modeling to the Dataflow sampling and analysis, says "Determining the spatial extent of the blooms is critical to our efforts to model the effect of the blooms on the York River ecosystem." Watch as VIMS researchers launch their aerial drone to help visualize algal blooms in the York River. View video.